These mums blooming in my yard were a suprise. I'd bought the mums before they bloomed, and was delighted to see the flowers. In New England, chrysanthemums as perennials (plants which come back to bloom year after year) is an iffy proposition. Sometimes they come back, other times they don't. So we usually go on a chrysanthemum shopping spree sometime in early fall to make sure our yards have floral color until mid-November. Usually the plants bloom in shades of red, orange and yellow. So, to have a pink version mixed in is fun. I hope this one comes back next year! There is a lot of detail in this painting if you look closely at the centers and the little petals surrounding it. 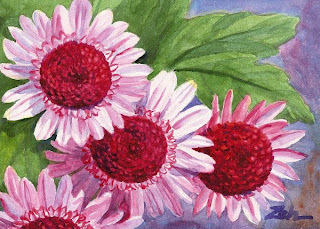 For a small painting, this is a bold one, toned down by the soft pink of the petals.